A Thought: Sacraments. Christians observe three Sacraments—those rites Jesus graced with His Presence: Baptism, Holy Communion, and Wedding. Last night I officiated a sweet and beautiful wedding. The couple are in love and perfect for each other. Jesus was truly there. 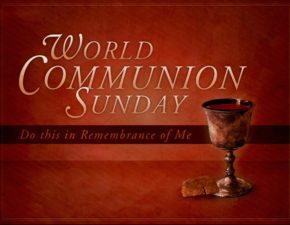 Today is World Communion Sunday, and we will celebrate the sacrificial and sacred Grace of Christ as we partake the elements in prayer. Baptized Believers are all about Grace—our salvation depends upon it!